The second attempt was the one pictured above, form Nigella Lawson’s Feast: perfect! Right consistency, right fluffiness, perfect taste! I am no chemist neither physicist (always had low grades in those subjects in high school…), so I don’t know how the tiniest different proportion between egg, milk and flour can make such a difference, but Nigella’s were much much much better!!! Beat together milk, eggs and salt and let it stand for 15 minutes. Add the flour, give a good whisk and let it stand for at least half an hour. In a 12 muffin tin, heat the oil in 8 of the holes in the oven. 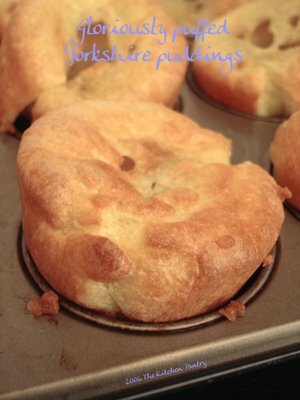 When the oil is sizzling, add the Yorkshire pudding mixture in each tin, filling it for about two third. Return it to the oven and let it cook for 20 minutes or “until they have puffed up gloriously” and they are golden. That looks SOO good. I’ve only made Yorkshire pudding once before and it did not end up well. I haven’t attempted it since, but I think I may have to try the recipe.